To say I was taken aback is an understatement. 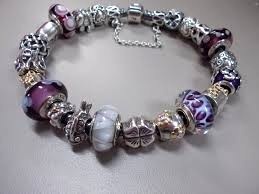 I had purposely spent time looking through all the Pandora offerings to select a charm that would be meaningful to her and a symbol of our relationship. Apparently, instead of conveying my appreciation for her love of Pandora and our shared experience, I had disappointed her by not spending enough money. Perhaps I should have realized that would be an issue since, on at least three occasions, she’d left the price tag on a gift she’d given me. The first time that happened, I figured it was an oversight. By the third time, I realized she wanted me to be aware of how much she’d spent. This is a reminder of what I don’t like about gift-giving. Many years ago, the adult members of my family agreed to eschew this tradition of exchanging presents for specific events: holidays, birthdays, and other significant occasions. It’s not that we don’t like gifts. We like them. Sometimes we love them. But we discovered that having to buy something according to a schedule didn’t result in the best choices. We also realized that once we were adults, we tended to buy whatever we wanted for ourselves, within reason, of course. What we couldn’t afford, no one else could afford to buy either. We now give gifts when they seem just right for the person, not for a particular celebration. The result has been many wonderful surprises, bought or made, and given simply because we thought the recipient would like it. We’ve shared this concept with our closest friends who have routinely been relieved to ascribe to the concept. Gift-giving has been taken from the realm of obligation and raised to a level in which each present is specifically chosen to convey spontaneous appreciation. I met Eleanor years ago when my father had a stroke and he became a fellow-resident to her in the nursing home. Eleanor had a sharp mind and even sharper tongue. Confined to a wheelchair like my dad, she had already survived an extended coma and a variety of physical impairments. She held court in the lobby, and those who could still carry on conversation gathered around her. She told stories and dispensed a good dose of gossip. She admired my clothing and sometimes had me pick up a similar skirt or blouse in her size. She was also quick to point out if she didn’t approve of an outfit, my latest haircut, or my lack of suitable undergarments. “Mind your business,” I told her once, and she accepted that as a fair enough proposition. She stopped criticizing and her sharpness mellowed just a bit. When she expressed appreciation for the butter cookies I made for the residents on holidays, I begin to bring Eleanor her own little tin. She fought with self-control and tried to stretch out the supply over several days. Frequently she failed and, eventually, I delivered a tin to her once a week, sometimes more often. Life in the Home offered few pleasures. Why not provide Eleanor with this little treat? “What can I do for you?” she asked, “I want to buy you something to thank you for the cookies.” Hard as I tried to convince her that seeing her enjoyment was all the gift I wanted, Eleanor insisted. “A necklace?” she asked and I inwardly cringed, knowing the displays of gaudy costume jewelry brought in for the residents’ purchase. “How about a teacup” I suggested, “the next time you have one of those flea markets.” Shortly after, Eleanor called me into her room and presented me with a small bundle wrapped in rumpled tissue paper. 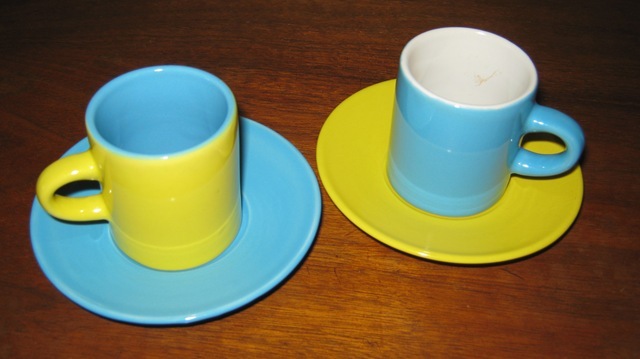 I opened it to find two demi tasse cups, one in yellow and one in aqua. The cups looked like all the colorful dishware I use from the thirties and forties. I exclaimed over her perfect selection, and Eleanor beamed with happiness that she could give something back to me. I continued baking her cookies until her health began to fail, and she stopped eating solid food. For a few weeks, I brought her chocolate bars that she didn’t have to chew. Then she could no longer eat those. One day, she was out of bed and back in her wheelchair. She told me she was feeling stronger and would let me know as soon as she was well enough for a new supply of butter cookies. I baked in anticipation. But Eleanor’s momentary recovery didn’t last. Just a couple of weeks later, she died. I mourned her passing and felt alone in my loss and sorrow. After all, she was neither my relative nor even someone whose last name I knew. Our lives had intersected for just a few minutes each week when I visited my father. How do you move on from that? I remembered my demi tasse cups. I made myself a pot of tea and poured the soothing liquid into one of the cups, and I felt Eleanor with me and knew I would continue to honor her memory each time I use one of those little cups. Dad died only weeks after Eleanor, and luckily I have a lifetime of memories and many gifts from him. Even before we had our family pact regarding gift-giving, Dad disliked the idea of buying something simply because some holiday or occasion dictated it, but he loved picking up a surprise because he thought it would give someone pleasure. 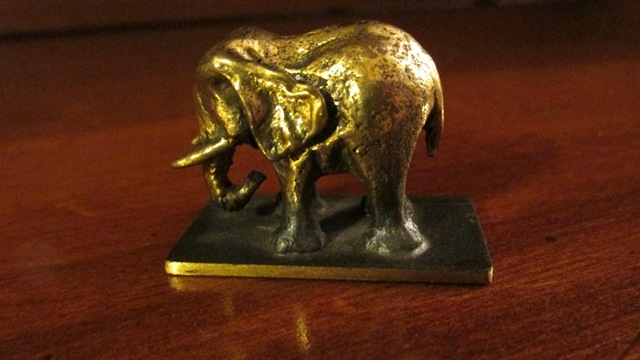 On a trip to England, he found a tiny brass elephant to go with the collection I started while in high school. Many years later, when tea was my new passion, he found a teapot he purchased at our synagogue’s annual fund raiser. Long after Dad remarried and moved up to Westchester, he still retuned the first weekend in December to attend the Beth Shalom bazaar. He showed his support of old friends by eating one of the home-cooked meals served in the bazaar “dining room,” a section of the auditorium curtained off from the row after row of booths. Not a big shopper, Dad still wandered the aisles looking to purchase an old book or something else that would add to the temple’s coffers. At the “collectibles” booth, he thought of my collection of teapots and asked if there were any for sale. A small pink teapot, probably from a child’s tea set was produced, and Dad brought it home to me. 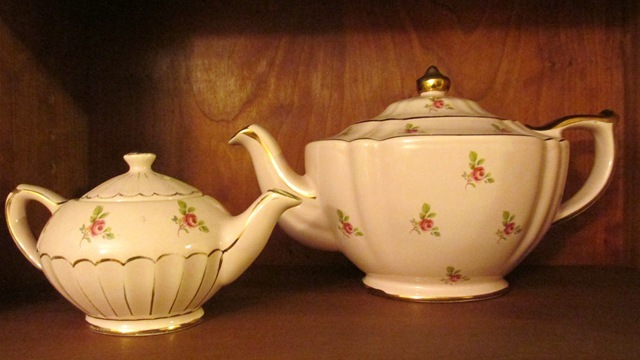 It sits on a shelf with a larger pink teapot of the same pattern. My most incomparable gift from Terry was his friendship, laced with wisdom and wit. A symbol and lasting memory of his love is the tile he gave to Jude and me when we purchased our country home. 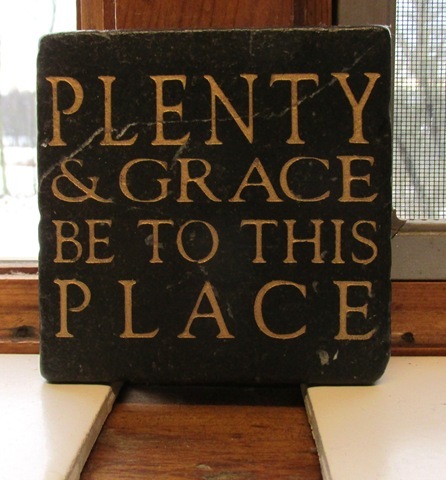 It sits on the windowsill above the sink: Plenty and Grace Be to This Place. Jude and I struggle financially, but I often think that the plenty and grace we enjoy has to do with the love and warmth of our home and our friends. Stephanie is a client who became a friend. She is wise and funny and has a heart of gold. Knowing I like birds, she gave me a bar of soap in the shape of a bird. It was made from natural ingredients (including biodiesel glycerin and activated charcoal) from the 2010 BP oil spill in New Orleans. I loved the graceful shape of the soap and didn’t want to wash with it. “Use it,” Stephanie encouraged me, “There’s something inside, and the soap will change color when you wash with it.” So it was. This wonderful item appeared slightly different each time I washed my hands. 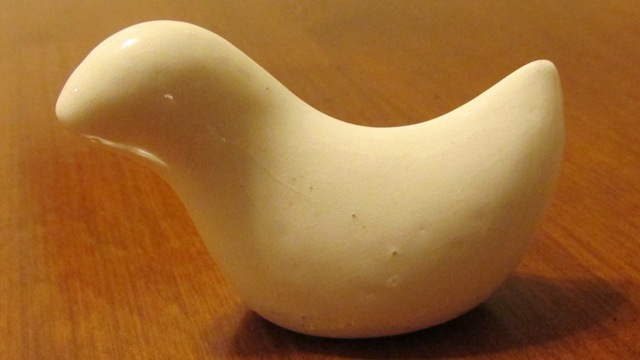 And when the soap was gone, a small white porcelain bird remained. It sits on my office desk, a reminder of the unexpected treat of finding a kindred soul in a work environment. Our dear friends Marci and Smitty give us many intangible gifts. One or the other turns up the heat in our house every weekend so when we arrive late Saturday evening, the rooms are toasty and welcoming. They put on the flood lights or plug in the holiday lights Marci originally strung on our deck, so our path to the door is well-lit. We call each other before shopping to ask if there’s a need for something from the farmer’s market, and we have shared evening after evening of good company and conversation. Sometimes, when Jude has made an exceptional breakfast that results in leftovers, I jump in the car (frequently still in my jammies) and drop off popovers or a quiche that our friends can eat while the food is still warm. One evening, Jude and I arrived at the house to find that Marci or Smitty had, as usual, turned up the heats and flipped on a light. 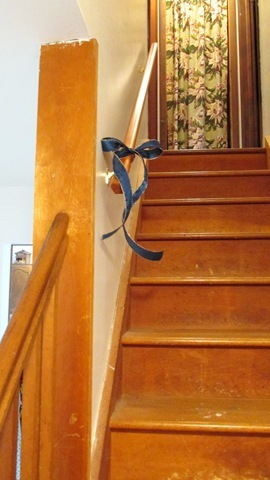 One of them had even put a big, festive bow on the stair railing leading to our bedrooms. We loved the touch even though we both wondered why the bow was in the hallway rather than somewhere like the kitchen where we would have seen it as soon as we’d entered our home. It wasn’t until early morning when I went downstairs to the bathroom that I realized why the bow had been placed in the stairwell. Until then, we’d had a railing that went halfway up the stairs. Marci and Smitty, with the help of another friend, had installed a railing that lined the rest of the wall. Now, whenever Jude or I go to the bathroom in the middle of the night, instead of balancing ourselves with a palm pressed against the wall, we hold the railing and say a silent thank you to our friends. Other gifts have been tiny but equally welcome and appreciated. Jude and our friend Jane each gave me a playful bear to add to my collection that sits atop my dresser. 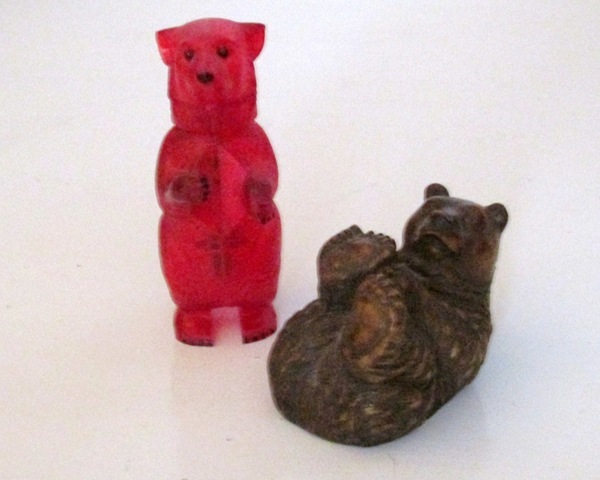 One is red plastic with a head that bounces up and down while the other, made of some sort of brown resin, is lying on his back, just asking to have his belly tickled. A similarly small but meaningful gift came from the matriarch of the store in which Jude works. 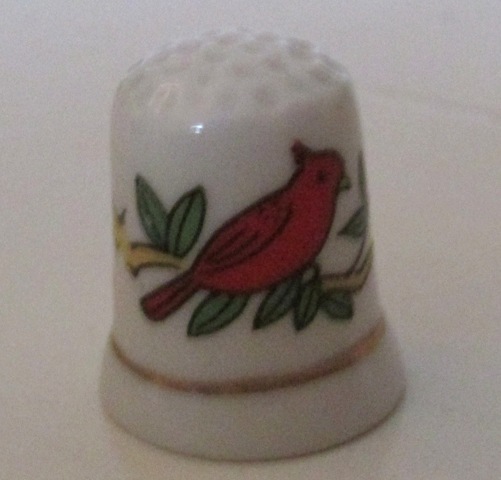 When Mrs. Raffetto had a big birthday celebration, she gave all the attendees and all the store’s employees a thimble along with a note about the history and use of thimbles which she had been collecting and treasuring for years. This sits on the desk where I write in my journal, and when it catches my eye, I think of the tradition and history it represents. A good read is one of the best treasures I can receive or give. 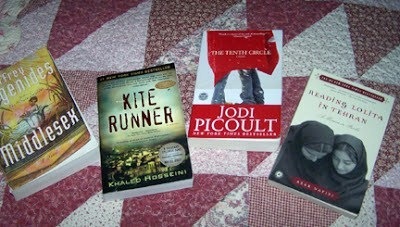 One of my cousins sends me the books she has just finished and loved. Stella and I, on one of our long-distance calls, share the titles of books we think the other will enjoy. Doris sends articles that relate to what we discussed over dinner. Georgia brings me home-baked cookies to nibble while I devour her latest suggestion of a favorite read. I lend or give copies of one of the many books that has opened my eyes and offered new possibilities. The holidays are approaching, and I listen to conversations about what to get this relative or friend. I hear the stress in people’s voices when they talk about shopping on a deadline. I see their consternation over what to get the person who has everything, or how unnerving it is to face the crowds in the stores. I think about the plaque from Terry and its message of plenty and grace. I think of what I have received and hopefully can continue to give in terms of caring and love. I have all the gifts I could want.